I'm currently at the BSG/CGS conference, and the BSG proceedings are now posted. That is all. More later. This week's PNAS has more theology. Murray and Schloss respond to Avise's oddly out of place theological article, and Avise replies. I don't have a PNAS subscription, so I can't read the letters without paying. Any generous soul who would like to forward me copies would be greatly appreciated. I just gave two talks at Summit, and now I'm working on my slides for one of my talk this weekend at the BSG/CGS conference. While I'm still catching up from my vacation, I noticed a few things of note that I wanted to share. After a nice long sabbatical, Paul Garner is back with a whole series of posts on his experiences doing field research on the Permian sandstones in the U.S. this summer. Check it out. Also, CMI has an interesting interview with Ariel Roth that is worth reading. I'm going to try posting from the conference this weekend, but I don't know exactly what the internet situation will be. So no promises. I'll definitely post more when I get back next week. This week's book is an extraordinary look into Sir Richard Owen's understanding of design. The volume it appears in is titled Lectures Delivered before the Young Men's Christian Association, in Exeter Hall, from November, 1863, to February, 1864. Owen's lecture is titled "On Some Instances of the Power of God as Manifested in His Animal Creation." There is also a longer book form of this lecture, but I haven't been able to obtain a copy. This condensed version still contains quite a powerful argument. And that makes me sort of sad. As I read this essay, I thought about the ID debate and my evolutionary creationist brothers in Christ, and I wished any of them could write anything remotely as compelling as Owen had. He almost convinced me... but not quite. My vacation is almost done (that's me in the pic). I'll be back at the end of this week. Some readers might know that I double as curator of the Henning Museum at Bryan College in addition to my duties as CORE director. We've been really busy this summer upgrading some of our exhibits, and I wanted to give you a sneak peak. We quadrupled the number of shells on display. This is the museum's most significant collection, and we wanted to put as much of it on display as we could, which is to say we've put maybe 2-3% of it on display. We also added a giant clam to the exhibit. It's not big enough to bathe in, but it's still pretty large. We reworked and expanded our skull exhibit. Joining the lion, leopard, and various local critters are the North American porcupine, a jackrabbit, and casts of a dugong and a giant beaver. Our mineral exhibit got a huge boost from a donation of six beautiful specimens from Bulgaria and the acquisition of a huge amethyst geode. Very nice. From the Library: "After its Kind"
Caldwell et al. 2010. Vibrational Signaling in the Agonistic Interactions of Red-Eyed Treefrogs. Current Biology 20(11):1012-1017. Readers will recall Liu and Soper's exogenation hypothesis for the origin of retroviruses. They speculated that retroviruses - like the AIDS virus HIV - originated as escaped particles from what were originally endogenous parts of certain eukaryotic genomes (like our own). While I like the idea of thinking backwards from the standard evolutionary model to come up with a creationist idea, I always found their hypothesis a bit limiting. It could really only explain retroviruses, which are just one family among many different types of viruses. In relation to that shortcoming, I previously noted the discovery of remnants of a bornavirus in mammalian genomes, but they were just fragments that looked more like insertions. Now, Taylor et al. report evidence of filovirus-like sequences in some mammals. You'll recall filoviruses as causative agents of the notorious ebola hemorrhagic fever. A while back, you might remember I stirred things up when I declared that there was evidence for evolution, that it wasn't a theory in crisis, etc. In terms of the culture war, underestimating the enemy is the worst thing you can do. In terms of truth-telling, it's just false to say that evolution is a failure or on the verge of collapse. Over and over, I emphasized that creationists can continue to be creationists, that we don't have to believe evolution, that we can still remain skeptical and search for other explanations. I just wanted to acknowledge that there's a good case, a really good case, to be made for evolution. That's really not such a big deal, but people still don't seem to understand it. I finally got to see Creation, the Charles Darwin biopic from director Jon Amiel, starring Paul Bettany and Jennifer Connelly. I've posted quite a lot about this movie previously (here, here, here, here, here, here, and here), so I won't rehash all that now. I found the film to be a dull cliche, to be honest. It was so dull, I don't really have much to say about it. It was just ... meh. It wasn't all bad. Paul Bettany did a good job playing Charles, and he certainly looked the part far more then Henry Ian Cusick in Darwin's Darkest Hour. I also thought the photography was strikingly lovely in places. But that's pretty much it. I'll be vacationing for the next two weeks. I have some posts scheduled to publish while I'm gone, and I will check in from time to time to see if there's any pressing news. Otherwise, expect sporadic email communication until July 25. I intend to be as blog-free as possible. Last week's Nature had some interesting articles in case you missed them. First, new ancient fossils purport to be the oldest multicellular life (they're Palaeoproterozoic in case you're curious). Fossils from this "time period" are notoriously difficult to verify as fossils and not just weird rock formations. I'm no expert in geochemistry, but this paper looks unusually thorough in the author's argument that these really are fossils. I'm not even going to try putting these in a creationist context, since I am simply too unfamiliar with paleontology. El Albani et al. 2010. Large colonial organisms with coordinated growth in oxygenated environments 2.1 Gyr agoNature 466:100-104. Not as cool as fighting dinosaurs, but still cool. The full title of this week's book is Noe Architectus Arcae in Diluvio Navarchus Descriptus et Morali Doctrina Illustratus. 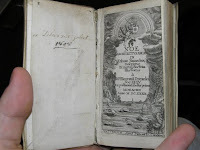 It was written by a German Jesuit named Jeremias Drexel and published in Antwerp in 1640. Our copy is a first edition. Drexel was quite well-known in his own time. He wrote thirty different books (nine published posthumously), and during the last twenty years of his life, more than 150,000 copies of his books were sold. There's something energizing about a good science conference. Hanging out with smart people, talking about smart things, listening to smart talks. There's just something cool about being in the same room with people like Joe Felsenstein or Doug Futuyma. Just being there re-energizes my brain. I had a really good idea for a whole new research project while I was there, and I got a few smaller ideas for improvements to other projects I'm working on.